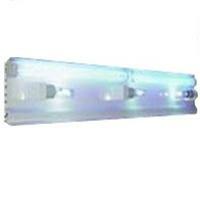 Hamilton Technology Metal Halide Lighting Retrofits are for reef aquariums. Retrofits are lighting systems made for installation into existing aquarium canopies. Please visit our Retrofit Lighting Chart page to identify the best light for your particular reef aquarium. A lens must be placed between the retrofit system and the tank to prevent water from splashing on the lamps and cooling fans must be installed in the canopy to keep the bulbs cool (and limit heat added to the tank). Three 250 watt 10K mogul base metal halide bulbs. Two 96 watt compact fluorescent actinic bulbs. Dimensions: 72" x 9" x 5". Remote metal halide ballast with 10 foot cable and quick disconnects. To keep the light cycle consistent, we highly recommend using a timer. To achieve the dawn/dusk effect we recommend the Coralife Aqualight Power Center Timer.